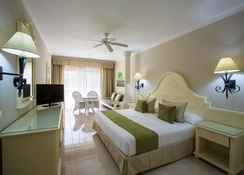 Located opposite a fantastic beach, the Gran Bahia Principe La Romana is constructed in a contemporary style. With 400 rooms, five splendid restaurants, three bars, spa, golf course, meetings & events facilities and a spectacular pool this hotel is sure to satisfy its guests. 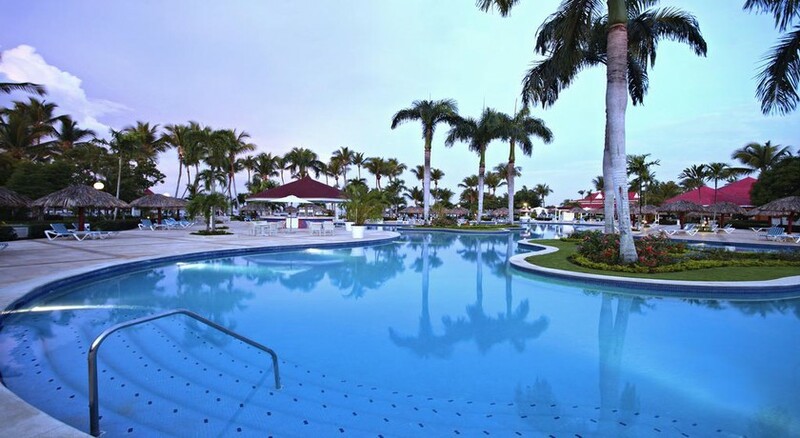 If you are planning a vacation by the beach with plenty of water sports, as well as a relaxing day at the spa, then Gran Bahia Principe La Romana is the perfect destination for you. One of the standouts at the hotel is the spa which offers a unique 4-hand body massage with specific oils from head to toe, which is sure to relax and rejuvenate you. The hotel also features some of the best restaurants in town. 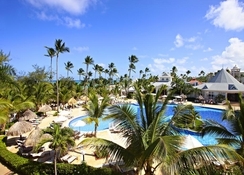 The Gran Bahia Principe La Romana enjoys a sea-front location in San Pedro de Macoris. As the beach is right opposite the hotel, guests have a lot of water sport activities to choose from. Golf lovers will not be disappointed either, as the La Romana Golf Club is only 1.4km from the property. The La Romana International Airport is 34km from the hotel. 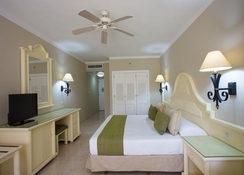 The Gran Bahia Principe La Romana features 400 guestrooms that are specifically designed to suit the needs of discerning guests. 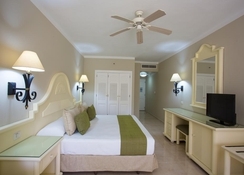 The guestrooms are categorized as Junior Suite Superior Ocean Front and Junior Suite Superior. All these rooms are luxuriously furnished with comfort and elegance you desire for a dreamlike stay. They include the following amenities: two full-size beds or one king-size bed, bathtub, well-appointed bathroom, magnifying mirror, hair dryer, ceiling fan, air conditioning, sofa, coffee and tea machine (infusions included), telephone, iron and ironing board, umbrella, alarm clock, LCD satellite TV, safe, mini-bar, hydro massage shower terrace and Wi-Fi in the room (additional charge). Orquidea Main Restaurant, Beach Restaurant, Capriccio Restaurant, Le gourmet Restaurant and El Pescador Restaurant are the five restaurants, where you can step in to have breakfast, lunch and dinner. 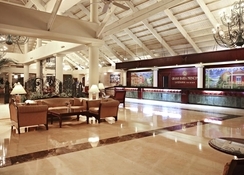 The hotel also houses three spectacular bars along with a pool bar and a beach bar. At Gran Bahia Principe La Romana, there are plenty of sports facilities to keep you and yours engaged throughout the day. Some of the sports facilities for adults include water sports, golf, spa, dance and entertainment and Bahia scouts (kids club). Additionally, there is a big adult-only outdoor swimming pool, where you can have endless fun in the sun, or relax in the spa. Everything about Gran Bahia Principe is just great. The staff, the facilities, the food, just great. We spent one week of sheer bliss there. There was so much to do, if you did not want to just sit by the immaculate sandy beach. The sea was not clear, but that has nothing to do with Gran Bahai. The staff were so friendly and eager to help (but not in a desperate way). No request was too much trouble, there was entertainment every night. The gardens are very well kept. We went all inclusive, the alcoholic local drinks are very free flowing, you need to be a little careful as the bar tenders are very generous. I have qualified in massage treatments and I am often disappointed. BUT at the spa the therapists did not cut corners and executed each massage as they should. Never leaving the body unattended, always keeping contact throughout the treatment. Just bliss, The treatments were not cheap - same price as the UK. I did not mind as they were very professional. All in all a lovely place to holiday.